Once again, if you have read my blog in the past, you might recognize the name “Jeanne”. Jeanne is a friend I made during my soil survey years in the Klamath Basin. 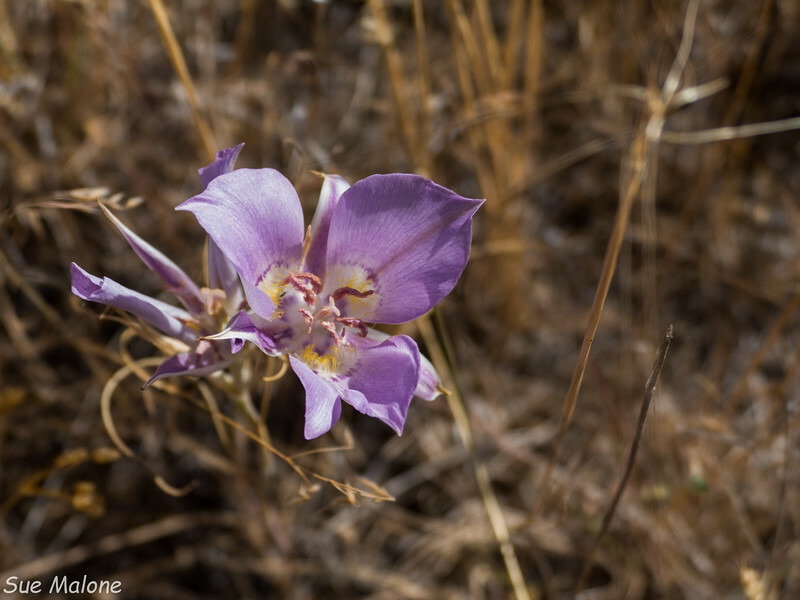 She was a botanist who at the time worked for the Forest Service and we worked together identifying specific soils and the plants that were connected to them. 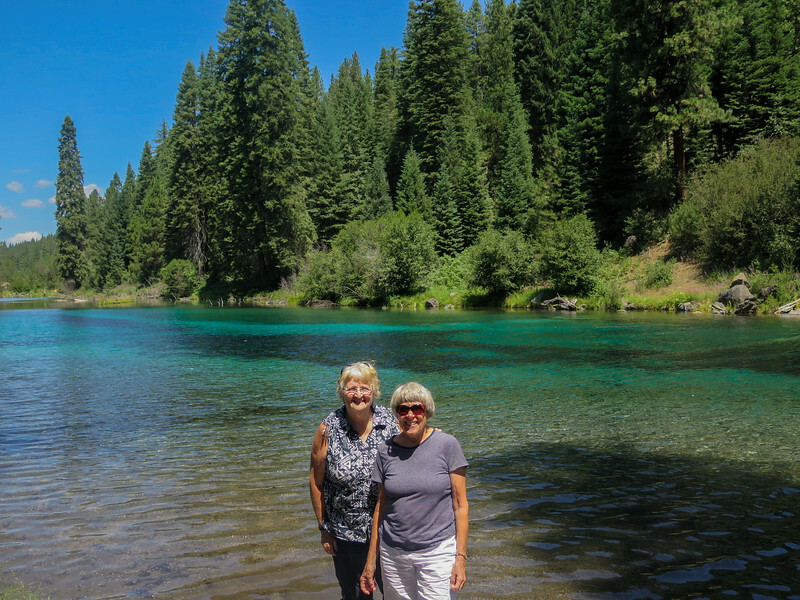 Our friendship began 15 years ago and in spite of Jeanne leaving Klamath Falls for her native Vermont, it still flourishes. This is where Jeanne lives now, in a timber frame home that was only a dream when I last visited. I attended her beautiful wedding with the love of her life in Vermont 3 years ago, and Jeanne manages to get out to Oregon nearly every year for crazy times with her wild bunch of extreme friends, then comes to my house to catch up on some down time. As you may have noticed over the years, I am a bit in awe of Jeanne. Her physical prowess is legendary, and she plays like a teenager. 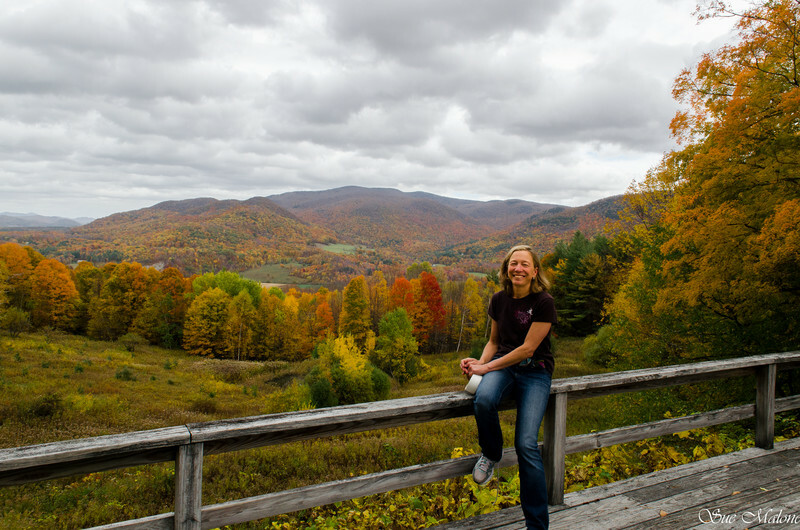 A Jeanne day often includes yoga, a trip to the gym, some laps in the pool, a run, a hike, and maybe a bike ride. 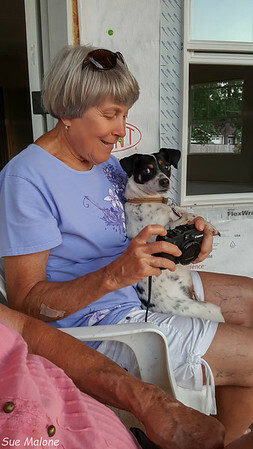 I could never keep up with her or her friends, so I am lucky that Jeanne also likes to go a bit slower, enjoys hanging out and talking and laughing, eating good food, and doing some slow sports. We had three really great days here at what Jeanne referred to as “La La Land”, the Running Y. We swam in the pool, walked the path, ate, talked and ate some more. 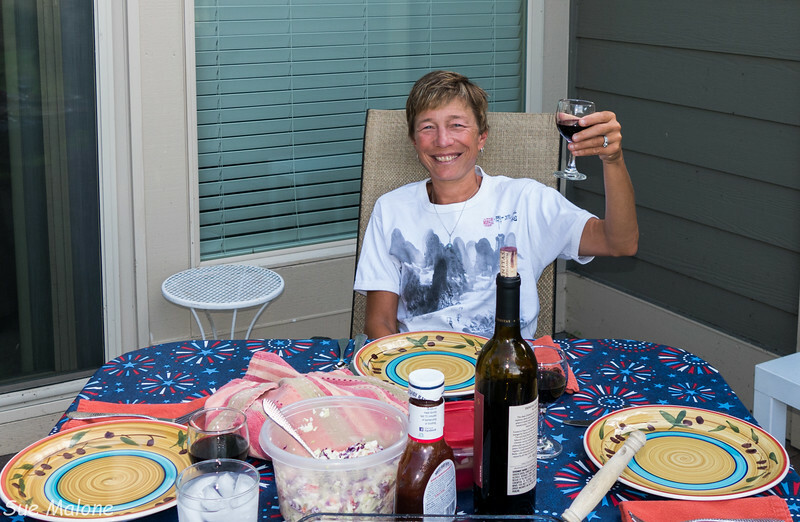 I cooked a few meals, including some ribs on the BBQ, one of Jeanne’s favorite things that I cook. 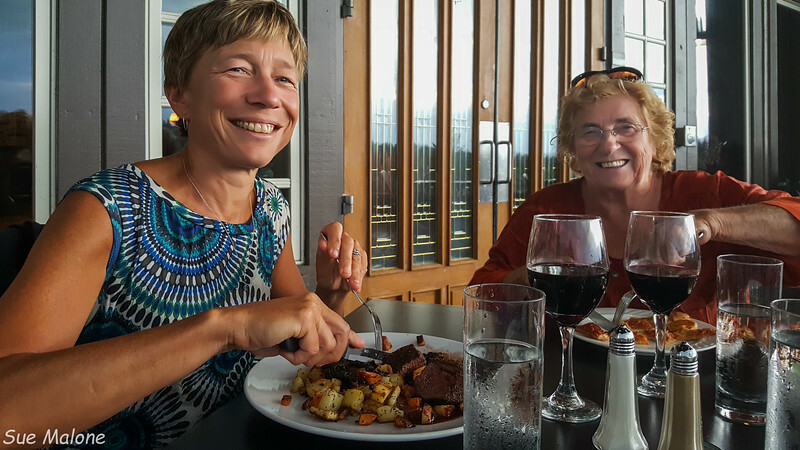 However, one of the highlights of the week was our second dinner in a week at the Ruddy Duck restaurant. We planned for dinner a bit later in the evening, hoping the sunny deck would have cooled some by then. 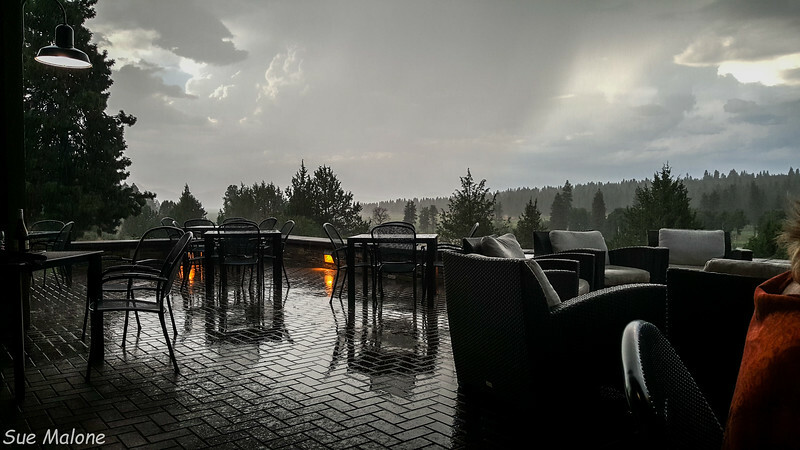 What we didn’t count on was the magnificent thunderstorm that moved in as we were waiting to be served. The skies got darker and darker and as the huge drops started falling and the thunder boomed all around us with huge bolts of lightning, we decided to at least retreat a bit under the deck overhang. What a dinner it was! 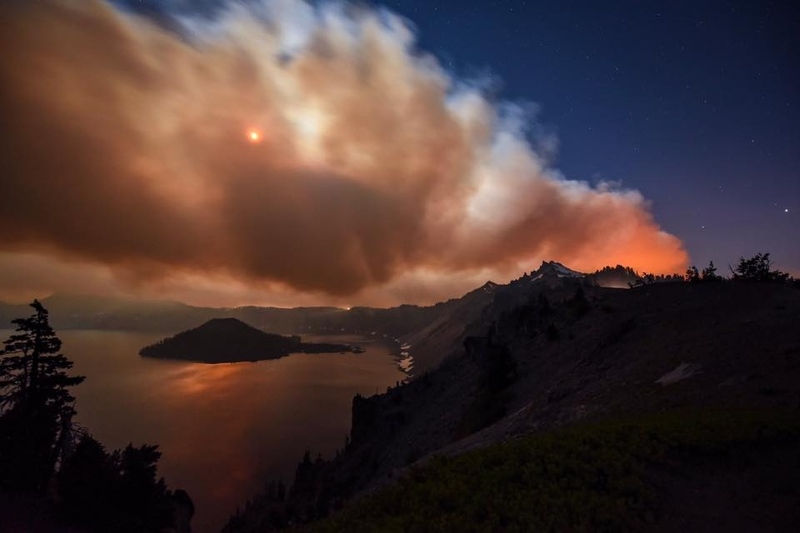 What a great view, and so incredibly dramatic. Later, as we retreated to the villa to watch the storm, the sky started turning blood red, with more bolts of lightning streaking across the sky in all directions. I have never seen a sunset storm quite like this one. 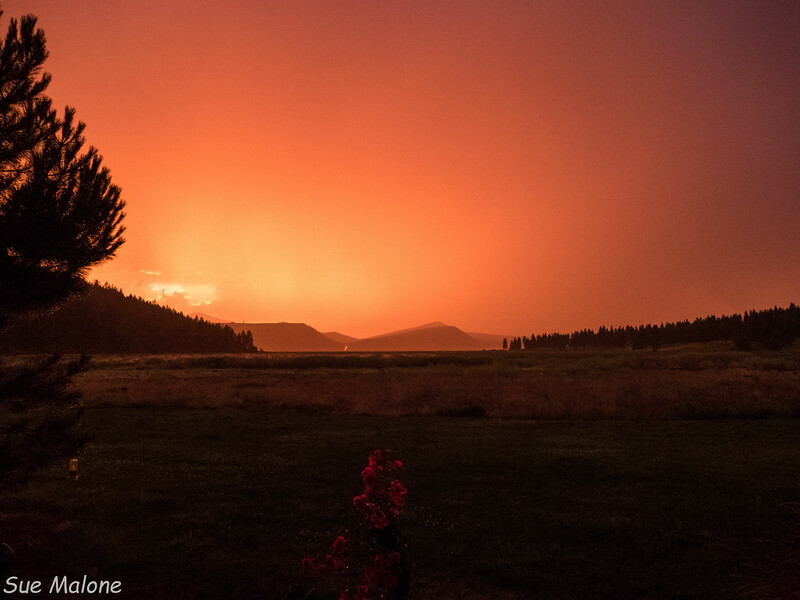 It was Jeanne’s last night in Klamath Falls, and was quite a dramatic sendoff! 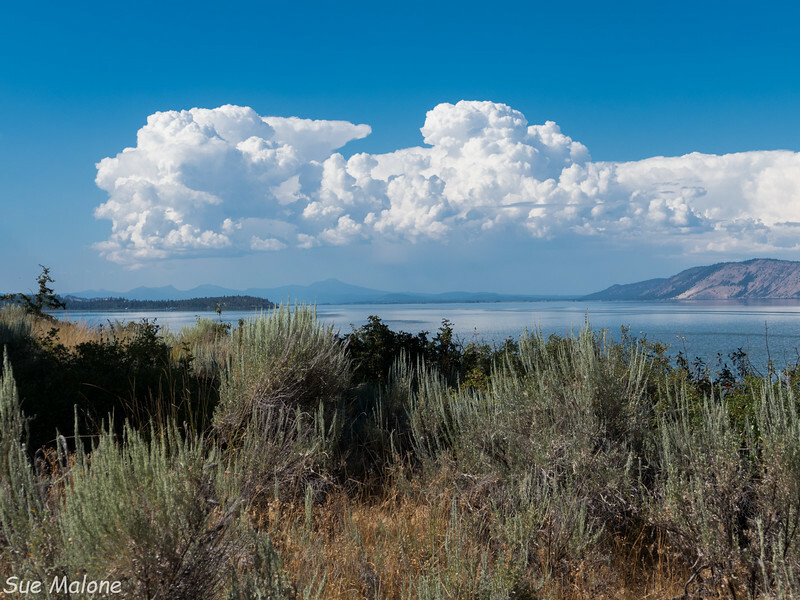 Earlier that day, Jeanne’s friend Margo came out to go on a hike on the Skillet Handle, a peninsula that extends northward from the Running Y into Klamath Lake. Mo and I had kayaked the lake adjacent to the peninsula last month and I was looking forward to seeing the beautiful white oak habitat up close. It was hot. Really hot. 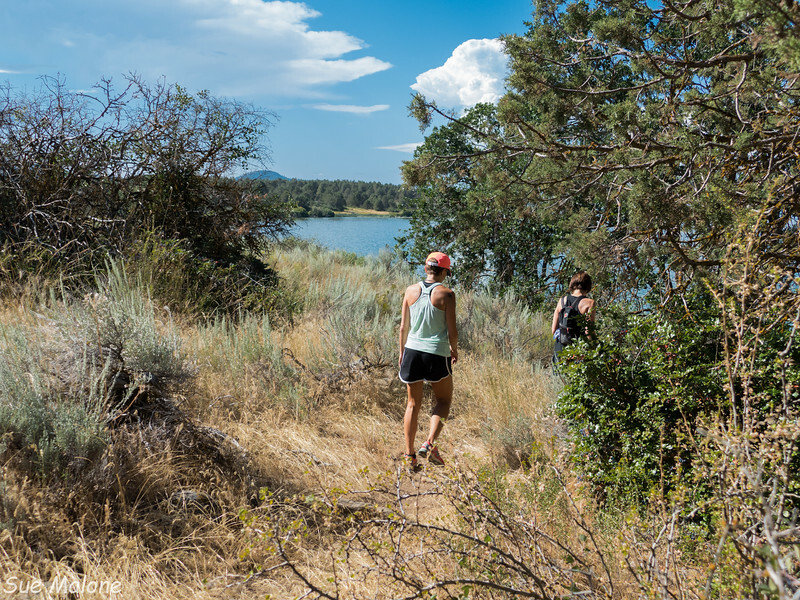 The trail was a choice between a gravelly old road and a dusty path through high weeds. Jeanne and Margo moved quickly, covering a lot of ground once we finally decided to get back on the “real” trail. It was way too hot for me, and I bid them farewell about a mile and a half in and walked back slowly trying to keep from getting heat stroke. Geez, it was hot. The huge thunderheads above were dramatic, but gave no clue of the show that was waiting in store for us that evening. On Tuesday, Jeanne and I left early for a morning kayak. We now have only two boats, and Mo offered to stay home with Mattie while we kayaked. 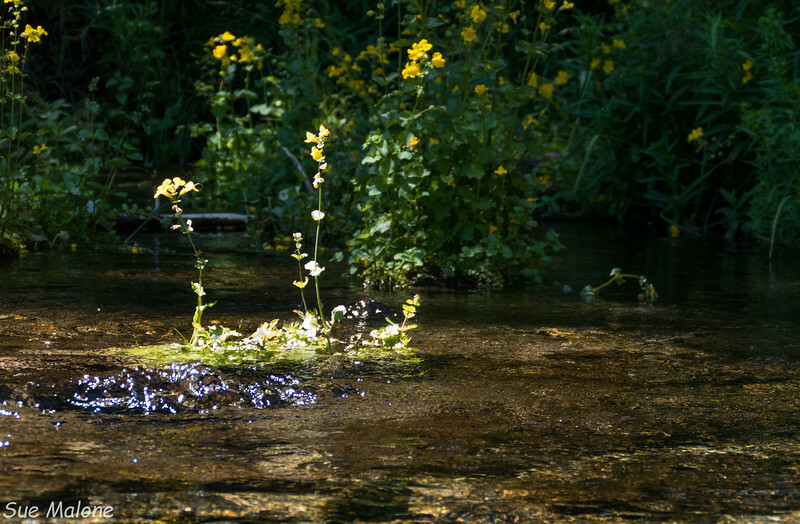 A week earlier, Mo and I had kayaked the beautiful Spring Creek Run with the Klamath Basin Land Trust. We have driven to the site in the past, but never actually kayaked the creek. It was so incredibly gorgeous that I knew it was the place I wanted to take Jeanne for our morning outing. 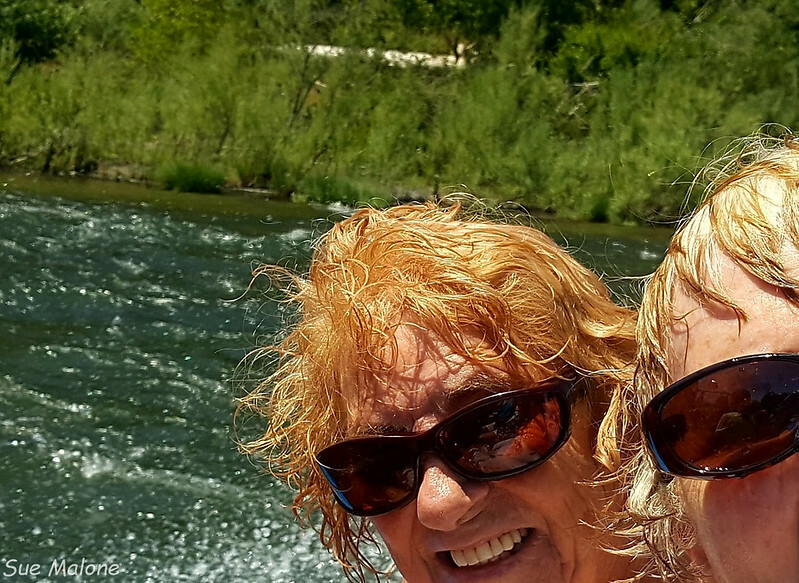 Jeanne has kayaked Recreation Creek with us many times in the past, so this was a nice change for both of us. The morning was just cool enough to be perfect and the skies had just enough clouds to be interesting but not threatening. 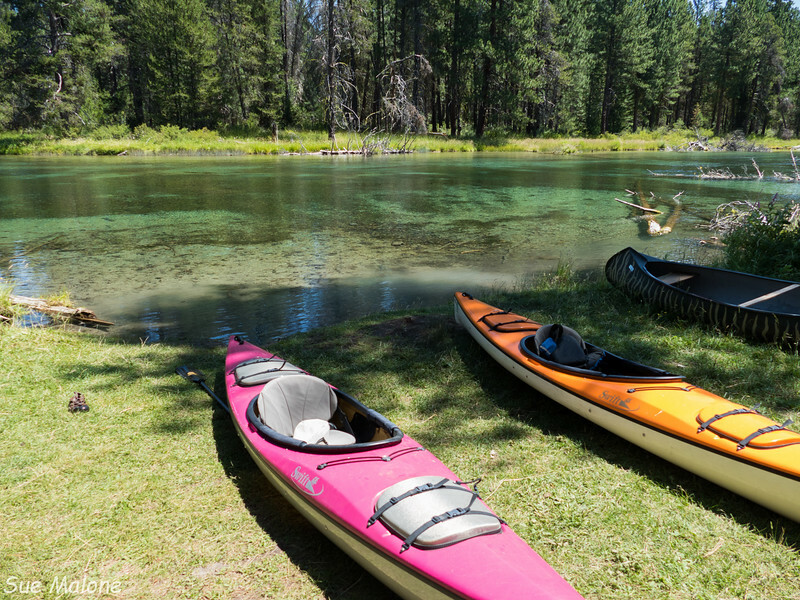 It only takes about 2 hours to kayak to the spring and back to the launch. 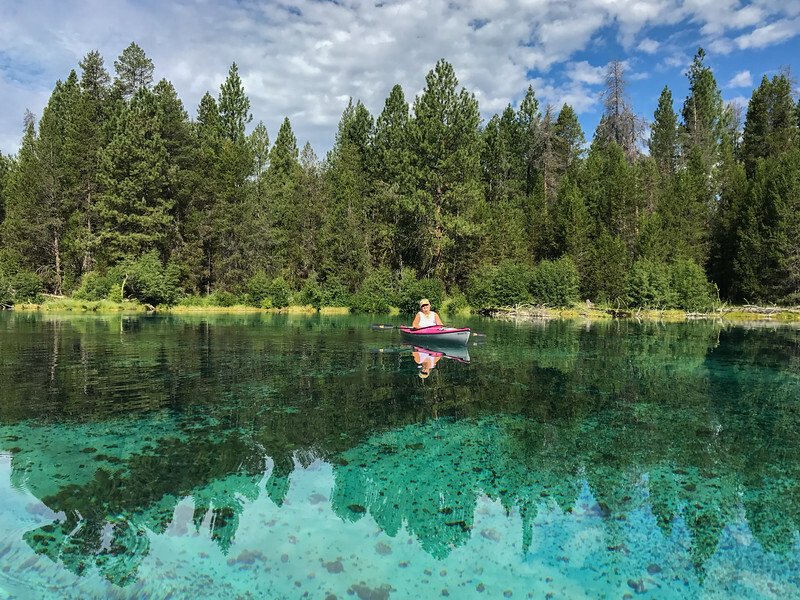 I think this is the most delightful boat launch I have ever experienced, even if the water was cold enough to put an ache in your feet in just seconds. We had the entire run completely to ourselves, without another soul on the water the entire time. 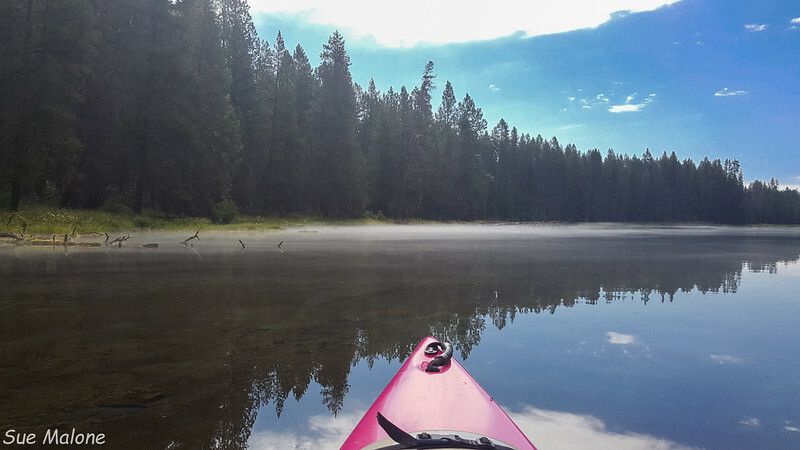 On the way back down, a mysterious mist rose from the water, backlit by sunlight, and the coolness was like a river of chill air as we paddled back downstream. We took photos of the bubbling springs, of the Mares Eggs, a globular translucent algae that is indigenous to the Basin, of the skies, and of the water which is as clear as any spring run in Florida. Such a beautiful morning, such a wonderful experience to share with such a good friend. 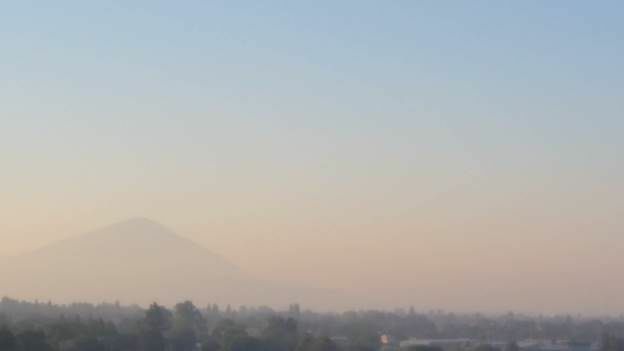 Later that day, we took Jeanne to Medford where she checked into a hotel to be ready for her early morning flight. Mo and I drove back to the MoHo at the new house, checked all the changes that had been accomplished in our absence, and crashed for a nap in the cool dimness of the MoHo for the rest of the evening. 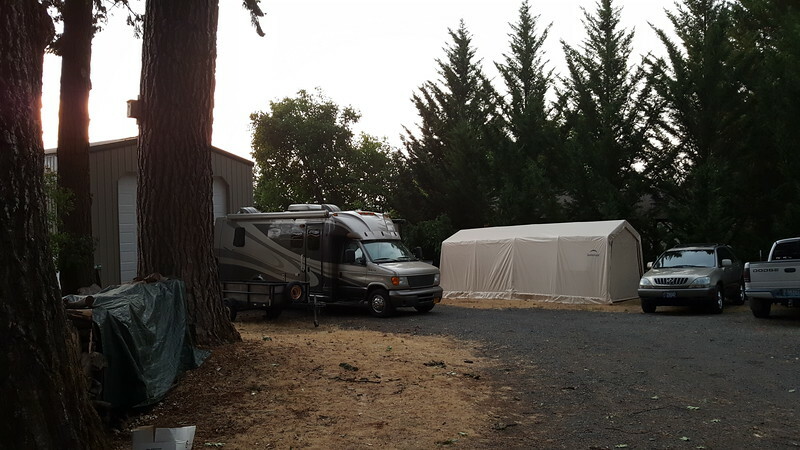 It was time to pack up the MoHo and head back down with our rig to Valley of the Rogue State Park, where we would meet more friendsfor another few days of fun times in beautiful Oregon, everyone’s favorite summer destination. 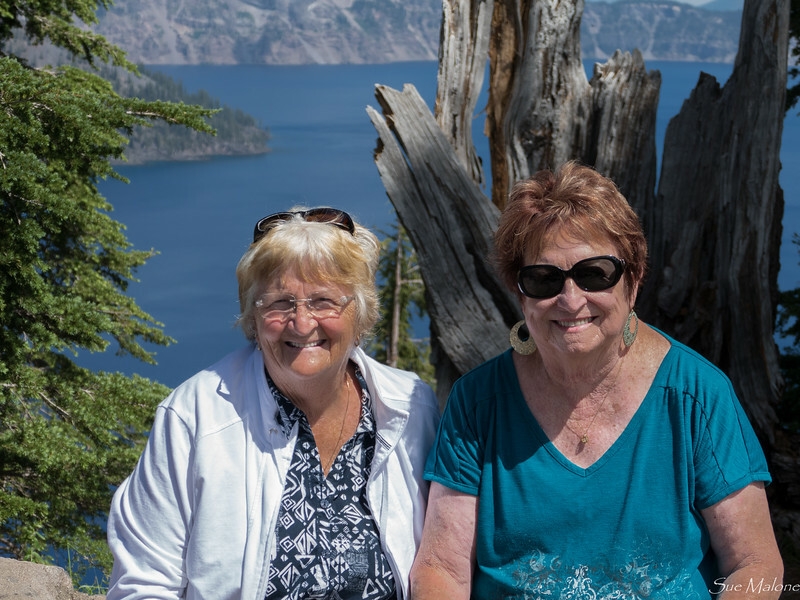 Next story, Crater Lake with Maryruth and Gerald! 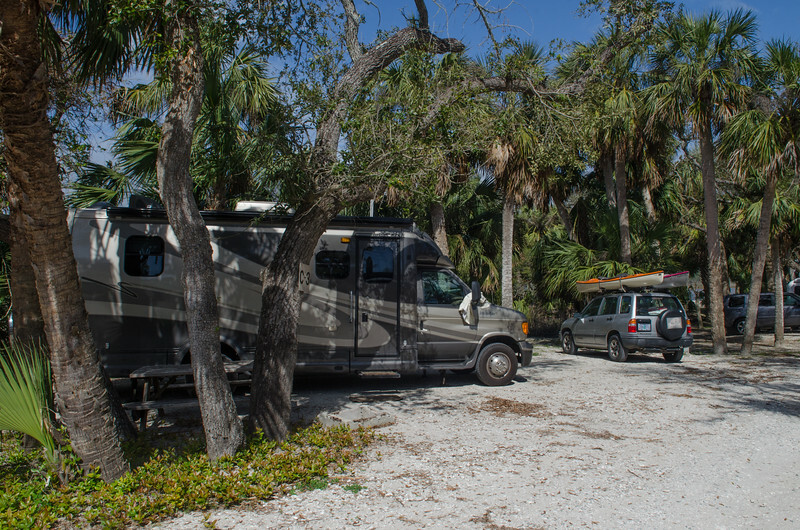 If you have read the blog for any length of time, you know we have made some great friends through RV traveling and blogging. I think most RV people know about this surprising benefit. We count Jimmy and Nicky, the Intrepid Decrepit Travelers, among our very best friends, and we never would have known them without the blog. 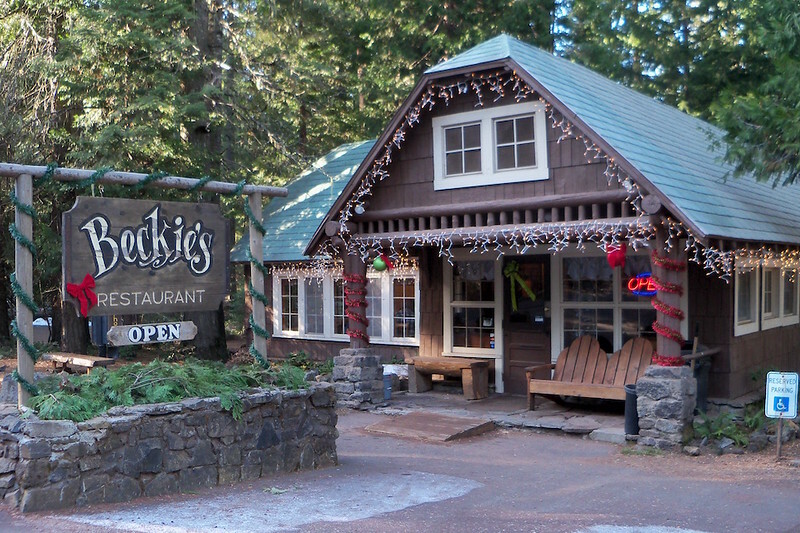 Needless to say, we were delighted when Nickie let us know they would be traveling our way to Oregon during mid-July. They wanted to see our new house in progress, maybe do some hiking (if you know the two of them, hiking is something they do a lot). 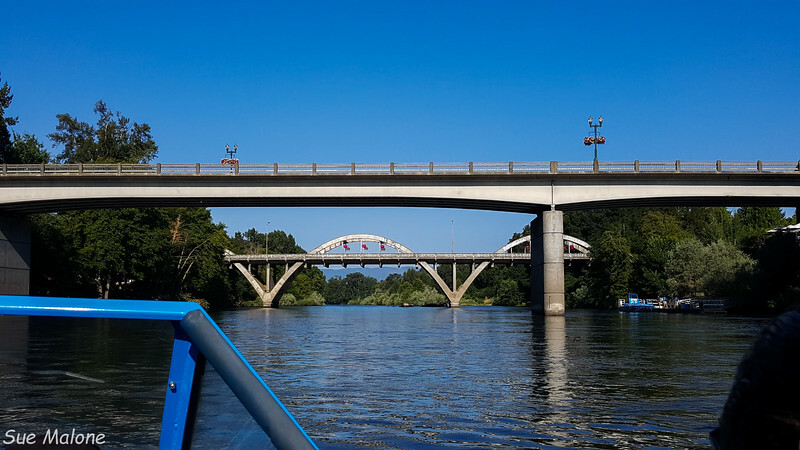 However, living in the Rogue Valley in summer can be pretty darn hot, and we thought it might be fun to spend a day on the fabulous Rogue River. That left a couple more days to spend doing fun stuff. 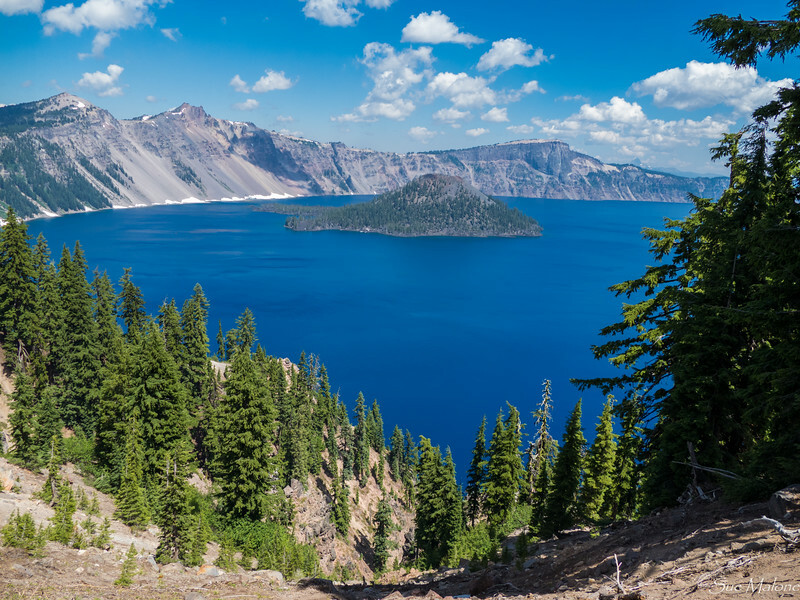 I sent Nickie an itinerary for a round trip route to Crater Lake, returning via a night with us at the Running Y. Nickie saw the google map and said, Yikes! (one of her favorite words), that is much too long to be in the car in one day. 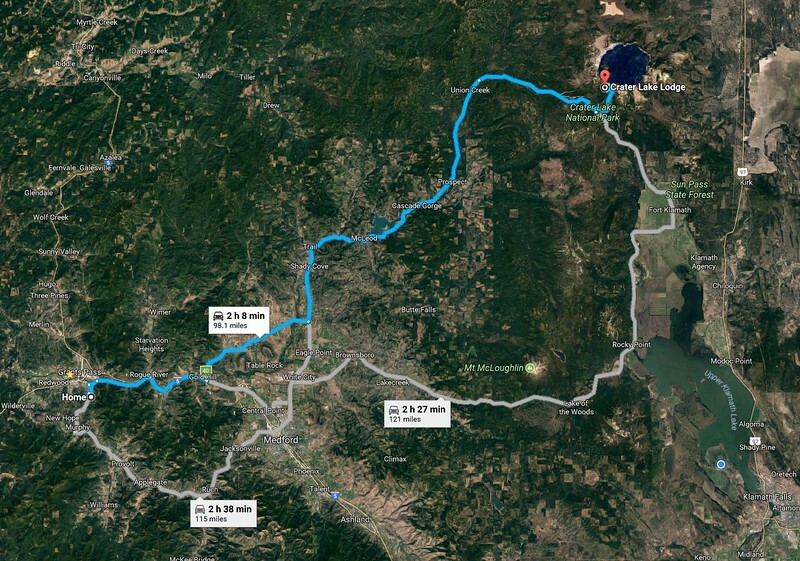 I think the route was something like 185 miles, with planned hikes as well? Maybe not. We nixed that plan for a simpler one. 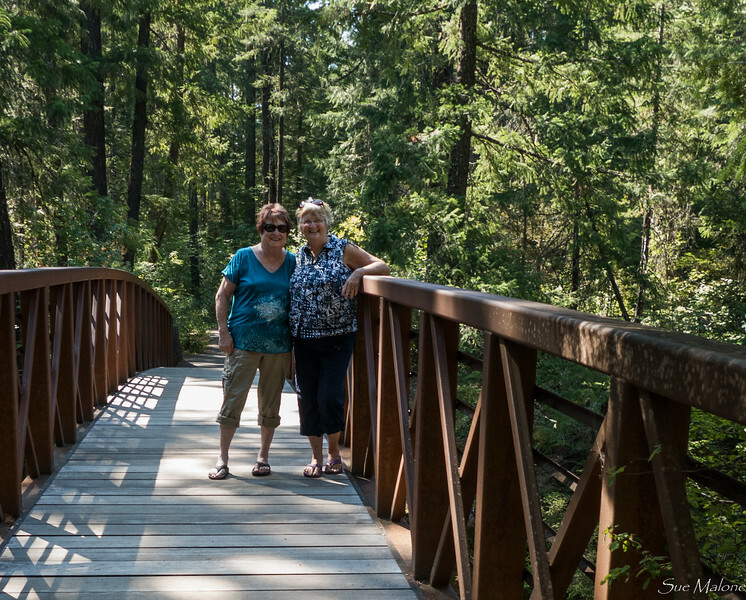 They arrived on Monday afternoon, in time for the 1 pm check in at Valley of the Rogue State Park, a lovely place just ten miles or so south of our place in Grants Pass. 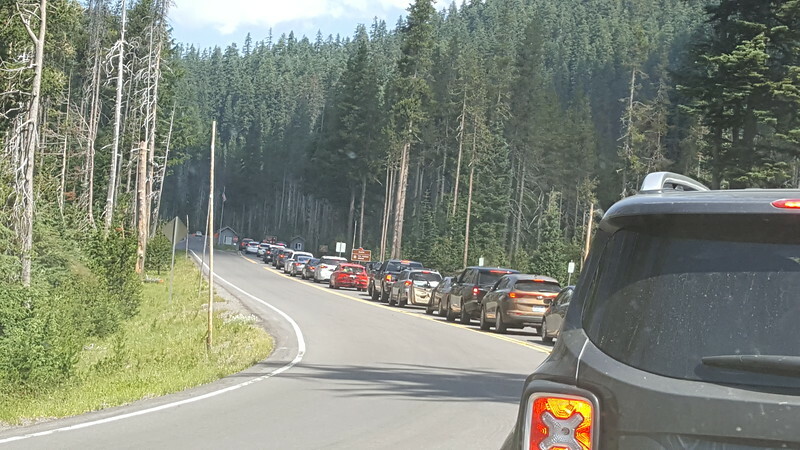 Instead, they were given a new check in time of 4pm, due to “site maintenance”, and had to park their motorhome “Tergel” out in the hot sun until check in time. We had already arrived at the house, but it was hot there as well, and everyone decided that our original meet up time at 5 pm at the house was still the best plan. It was hot. Did I already mention that? 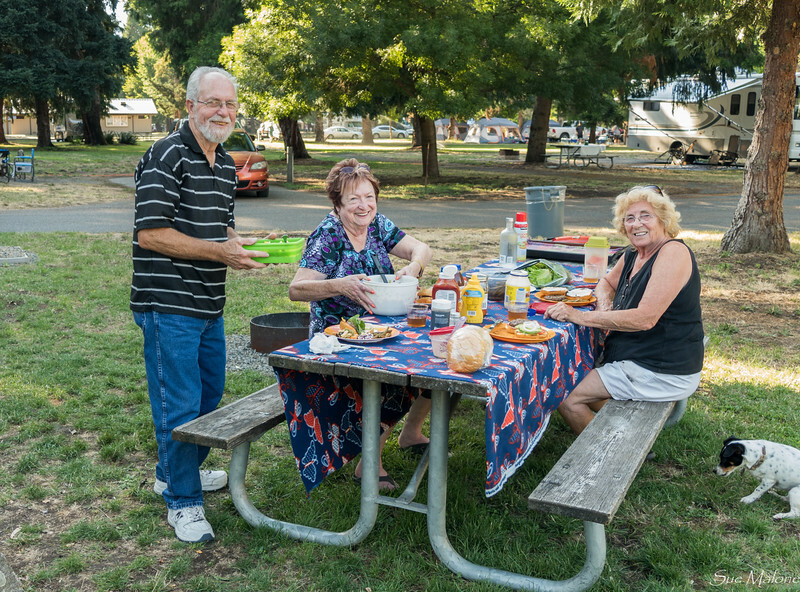 With the air going full speed in the MoHo and the Weber Q outside on the picnic table, I managed to put together a meal for the four of us to share in the new house. 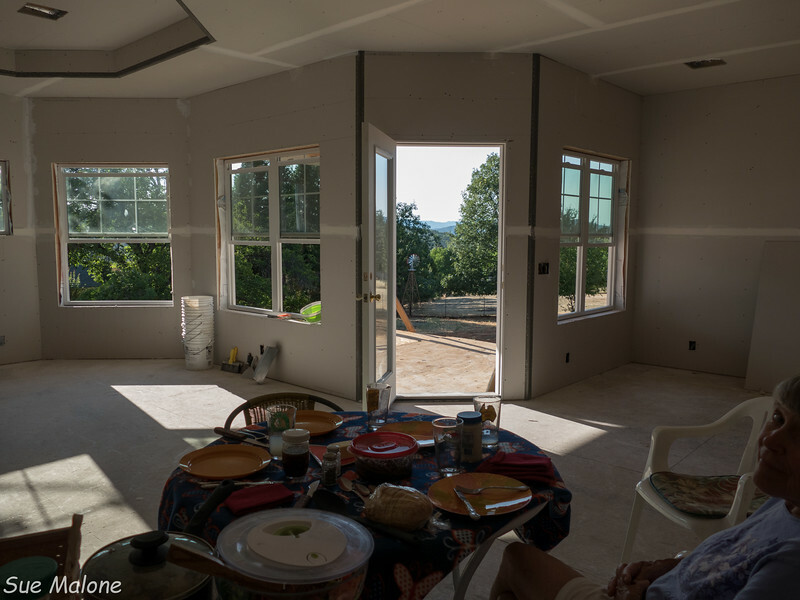 After showing them around, talking about all the fun things to come with our house, we set up a table in the “dining room” where the breeze kept us reasonably cool. 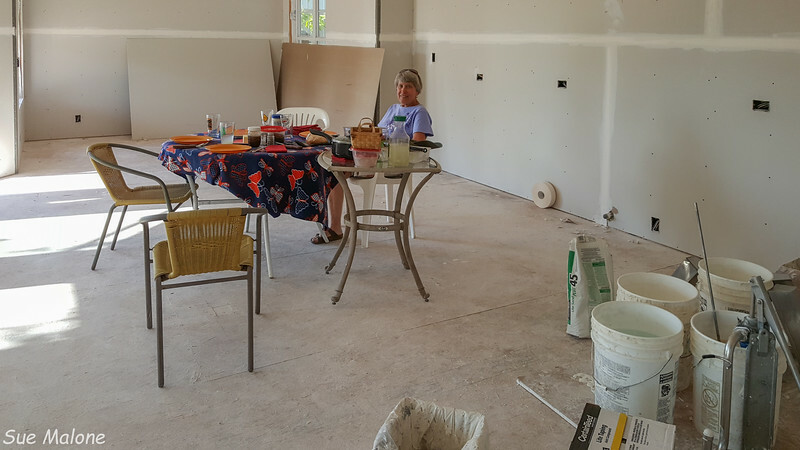 Nickie and Jimmy were our second dinner guests in our new home, although they were the first to enjoy walls as well as the subfloor which was all we had when I cooked dinner for Grandson Matthew. 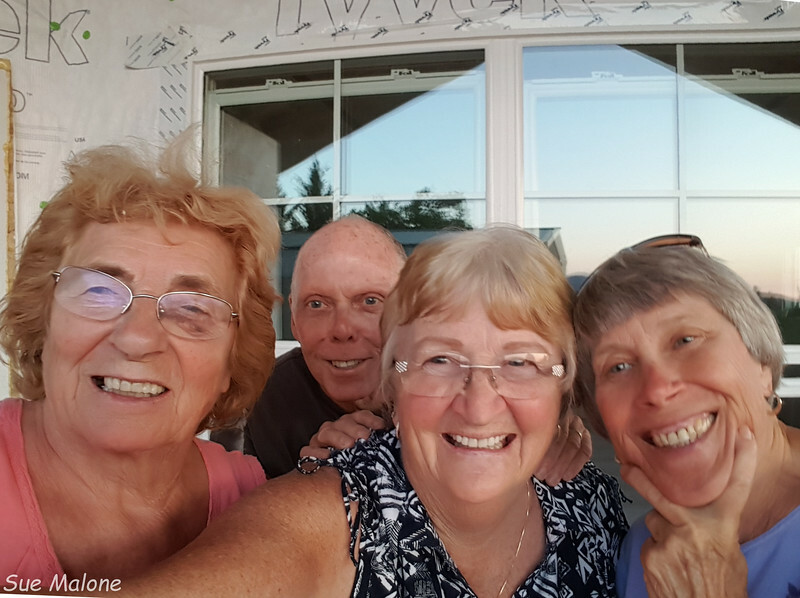 As is always the case when we get together, there was lots of laughter and silliness all around, playing with photos and trying to get selfies of the four of us. Nickie worked very hard at getting her camera to actually take a time release photo, triggering even more laughter. 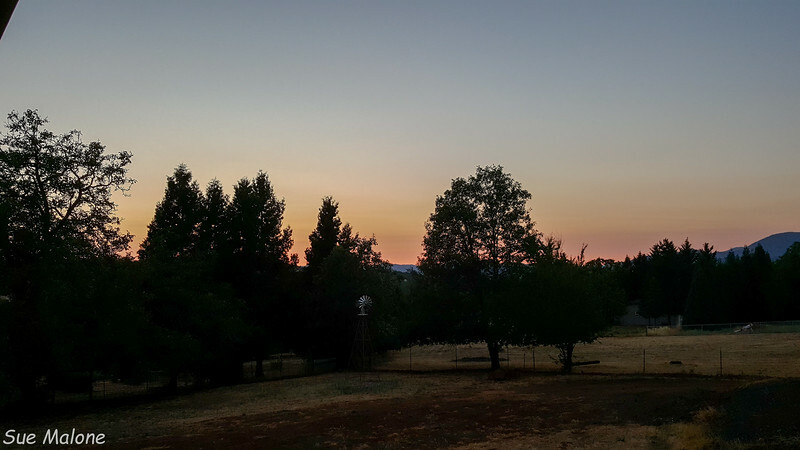 Sunset from the porch was lovely, the company was fabulous, and we all looked forward to the next morning’s adventure. 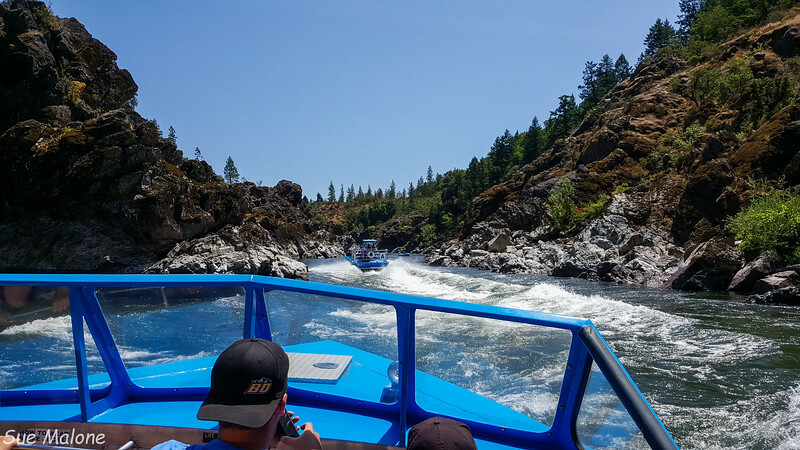 If you live in Grants Pass, the most exciting thing to share with friends and family is a trip down the Rogue in a jetboat with Hellgate Excursions. We were lucky this year. 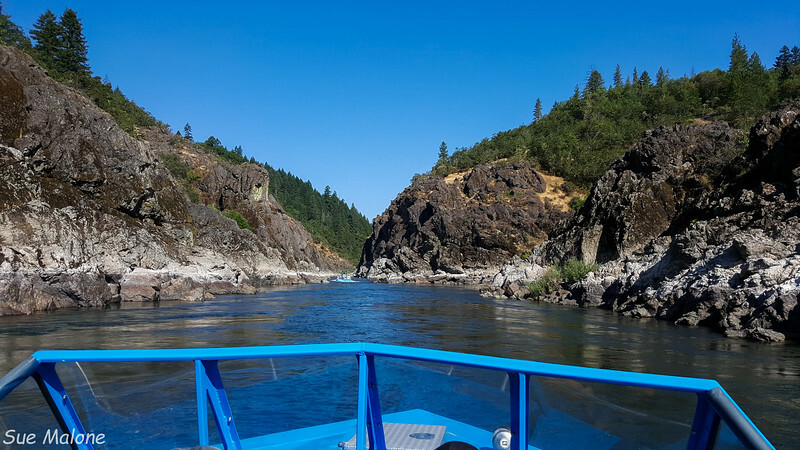 Lots of winter rains allowed the boats to run through Hellgate Canyon much later in the season than usual. Sometimes by mid-July, the boats can no longer make the long day trip and will only travel as far as the canyon. 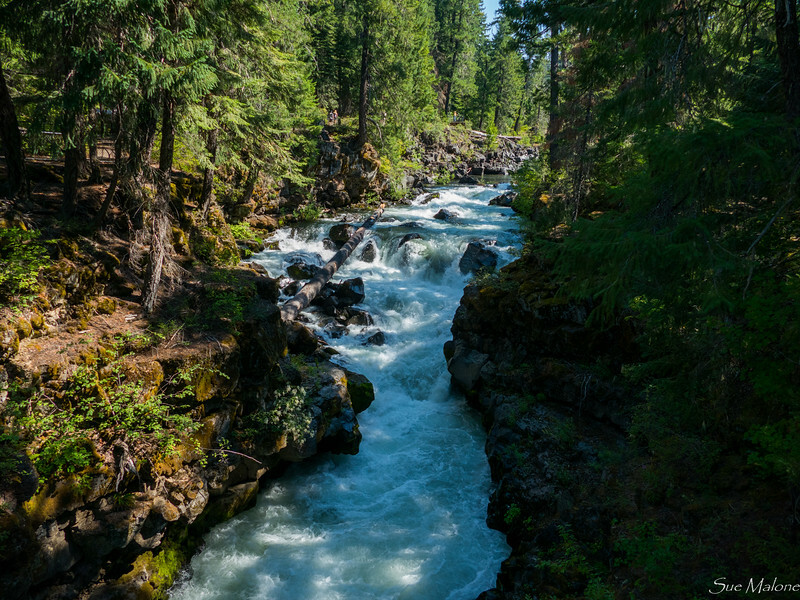 Our trip went through the famous canyon, beyond Graves Creek, and to the beginning of the permit required area of the Wild and Scenic Rogue. The day gorgeous, a perfect day for enjoying the river. 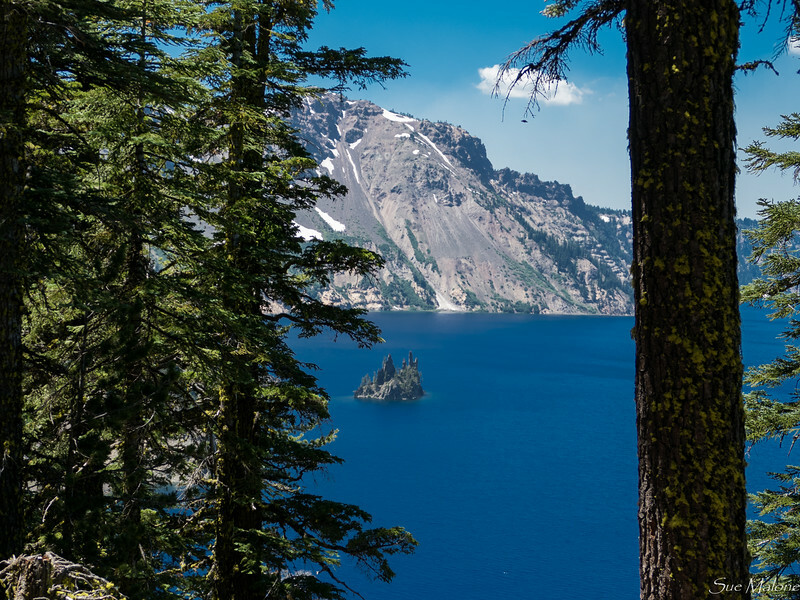 The Rogue is a magnificent river, emerging from Crater Lake and winding through some of the most pristine wilderness in Oregon on it’s way to the Pacific Ocean emerging at Gold Beach. From Gold Beach, there are mail boat runs you can take for a day trip up river to Agness, something Mo did a few years ago, but I haven’t yet experienced. I did take my phone along, deciding that getting the camera wet wasn’t worth it. 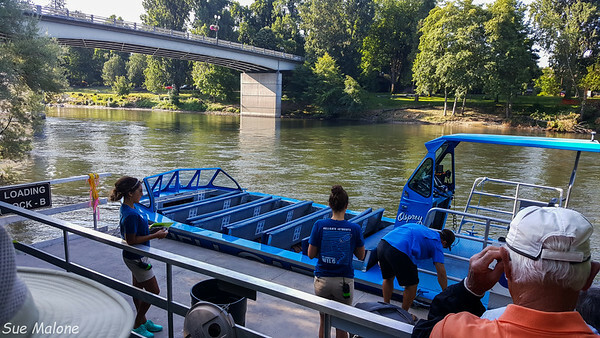 Hellgate Excursions promises that you WILL get wet. I put the phone in a zip lock and only brought it out at safe moments. Or so I thought. The boat captains love to do that big spin thing that jet boats do, and we were traveling in tandem with another boat. A few times we got a bit of spray here and there when they spun, but toward the very end of the trip, at the last place where spinning was allowed, the other captain decided a full on drench was in order. The wave that came into the boat wasn’t just spray, but like standing under a big wave in the ocean. The phone got wet. Thank goodness I managed to get it under my body upside down, and when it was all over, the phone was OK. Whew! I don’t have insurance on that ridiculously expensive Galaxy Note 5. I did manage to get a few photos at least. After a long day on the river, hot sun, and all the excitement, the four of us were perfectly happy to retire to our own places for the rest of the evening. 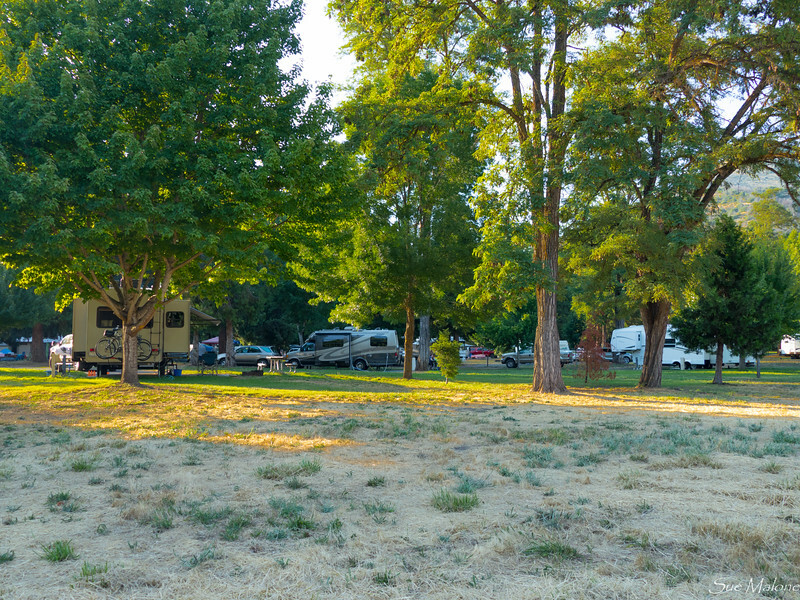 Early the next morning, we drove to the park to pick up our two guests for another day of adventuring, this time driving over the mountains from the Rogue Valley to the Klamath Basin. We wanted to share the delightful luxuries of our Running Y villa with them. 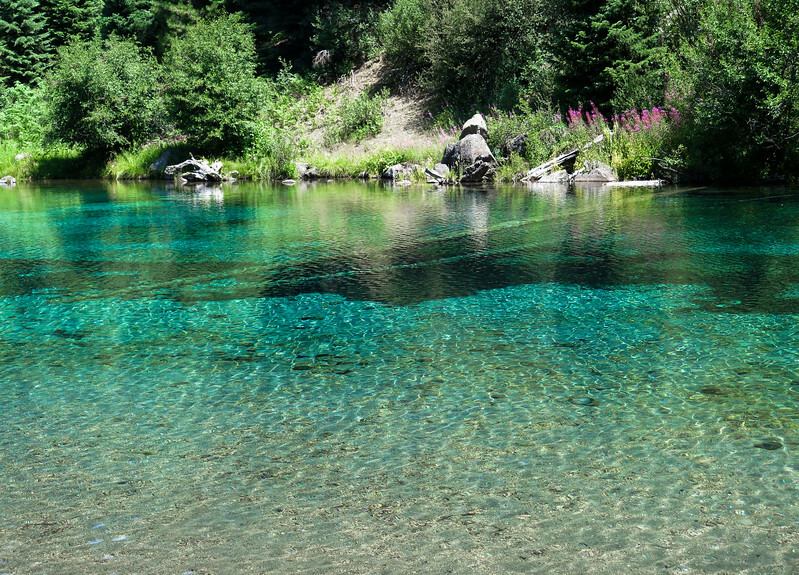 On the way, I mentioned I knew of a few nice places to check out along our route, and since this was a “water trip” for The Intrepid Travelers, they like the idea of visiting lakes and another beautiful headwater stream. Lake of the Woods is right along the High Lakes Pass on Highway 140, the route we have traveled more times than I care to count. Somehow with friends along, on a gorgeously clear sunny day, it looks all fresh and beautiful again. 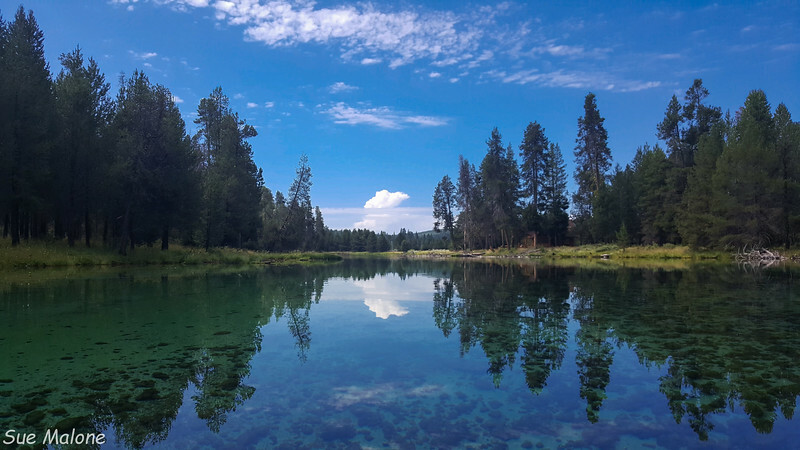 We then traveled north through the Wood River Valley to the beautiful headwaters of the Wood River, and yes, that turquoise is absolutely real. I love the colors of a pure spring. Mattie had a great time leaping about in the grass, and while it was hot, the mosquitos weren’t near as bad as they can be. We had a makeshift lunch of cheese and crackers and veggies that just happened to be in the ice chest I was taking back from the MoHo to the Villa, so that was a lucky break. 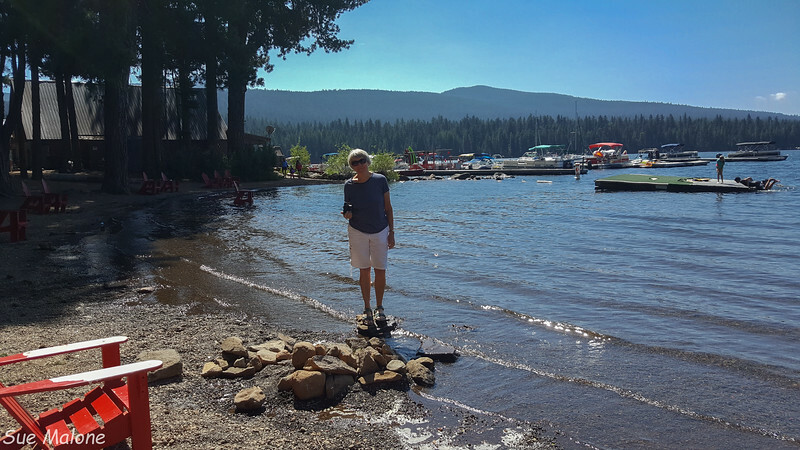 Returning to the Running Y, there was time for a lovely cool swim before we took advantage of the lovely Ruddy Duck restaurant located in the main lodge of the resort. 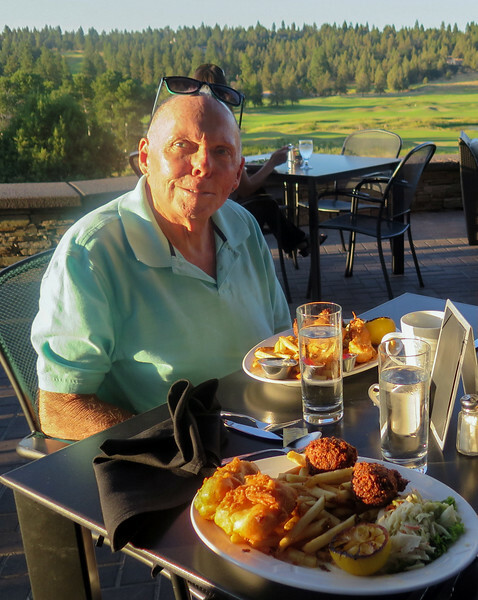 Dinner on the deck overlooking the golf course and the surrounding mountains was amazing. Mo and I have had drinks on that deck now and then, but until this evening hadn’t had dinner there. Definitely worth repeating, and thank you Jimmy and Nickie for the great treat! The next morning the 4 of us took Mattie for a walk on the 3.5 mile path around the golf course before we had breakfast. I like cooking a big breakfast for company. Don’t often do that for ourselves, so it is nice to have an excuse for all the trimmings. 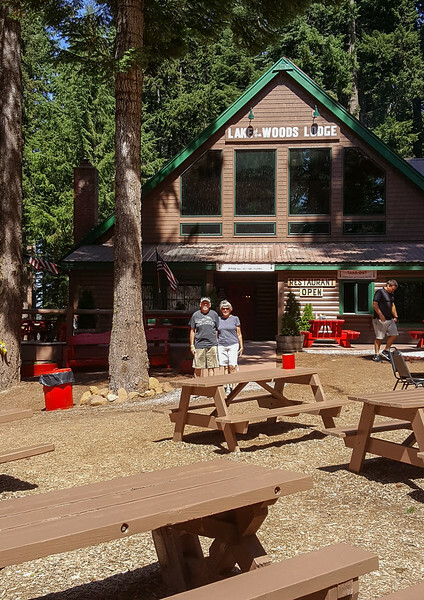 In spite of the 4 pm check-in time, there was still a 1 pm check-out at the Valley of the Rogue. 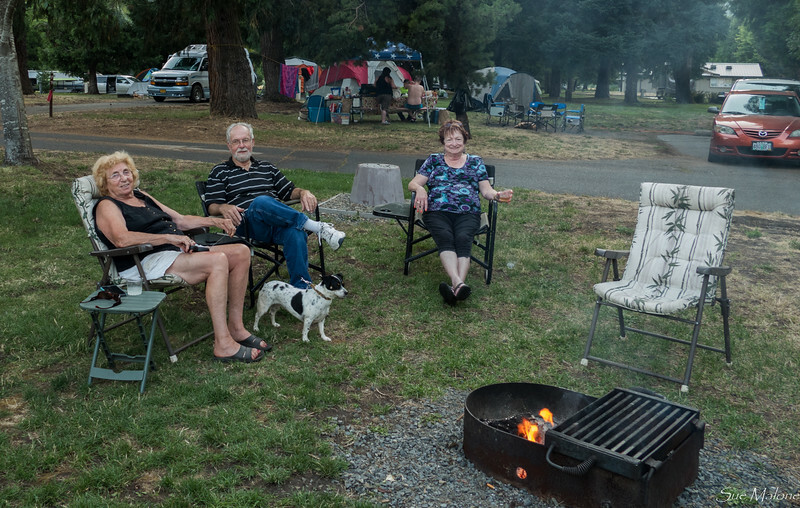 We packed up and loaded into the car for the trip over the mountain by 11 to get our guests back to Tergel sitting at the park waiting patiently for the next leg of their Oregon adventure. What a special time to share with good friends. Lucky Us! Mattie is completely unconcerned about thunder and lightning in Grants Pass. Alert, but totally relaxed. As I wrote last time, we knew that July had much in store for us. Almost every single day was full, with tight schedules that made us often ask, “What are we doing next? Where are we heading next? Which house will be in on x date?” Every minute was truly wonderful, and if we breathed a sigh of relief at the end of the month, it was only to catch some air and some down time. I decided to write about each visit and adventure individually, to give each one the full credit it deserves, but wanted to get all the house update stuff done first, to clear my mind of that ongoing process so that I can relax and enjoy the great memories we made last month. 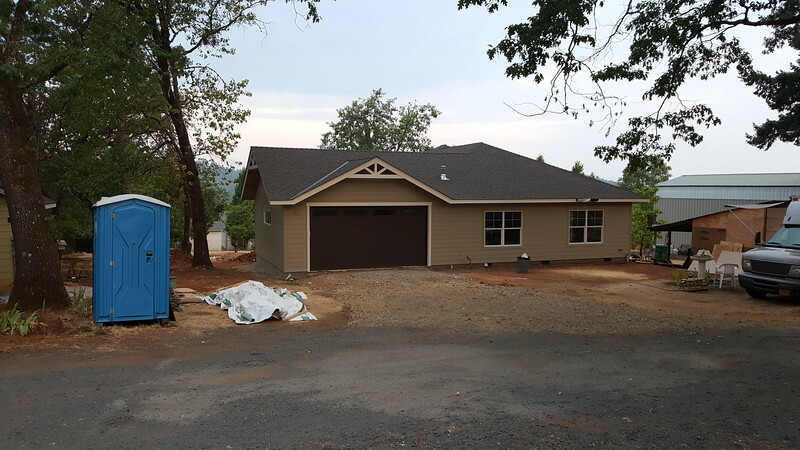 July 17 It was exciting to return to Grants Pass after a week away, partially because we knew Jimmy and Nickie were coming, but also because we knew that the A Team was returning to begin putting up the siding. 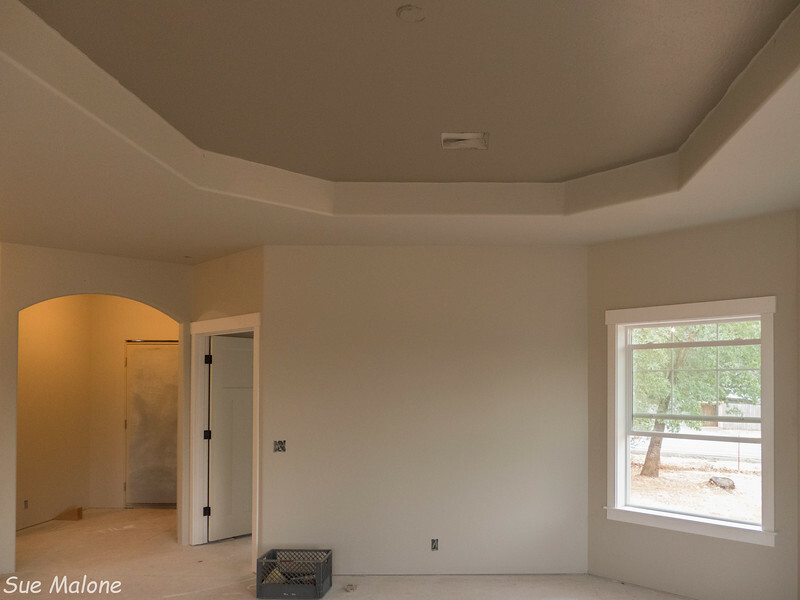 The interior was a surprise as well, with all the drywall completed, and the tray ceiling at last actually recognizable. 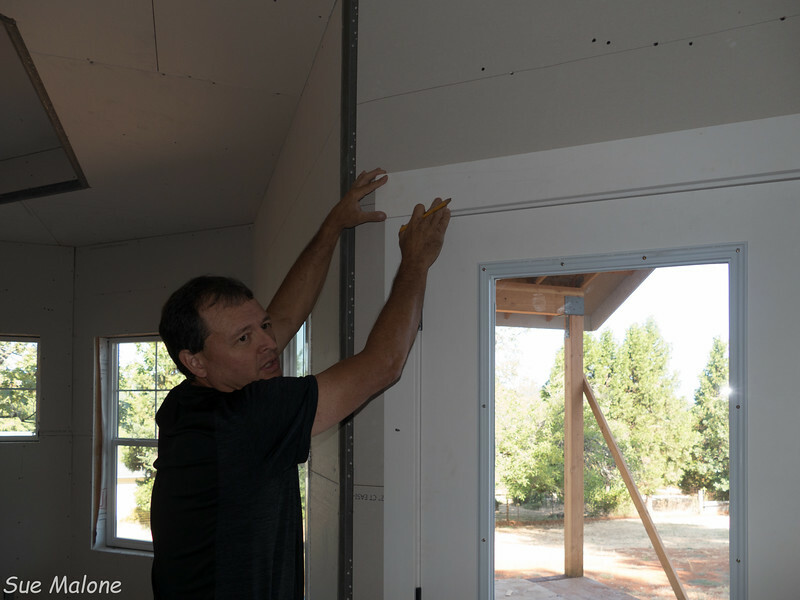 Gary spent quite a bit of time with us working out the details for our trim choices for the windows and doors, and deciding on what kind of crown molding would look best in the tray ceiling. It was wonderful walking around in the house and seeing it with defined spaces, feeling the rooms more clearly, and enjoying the lightness. 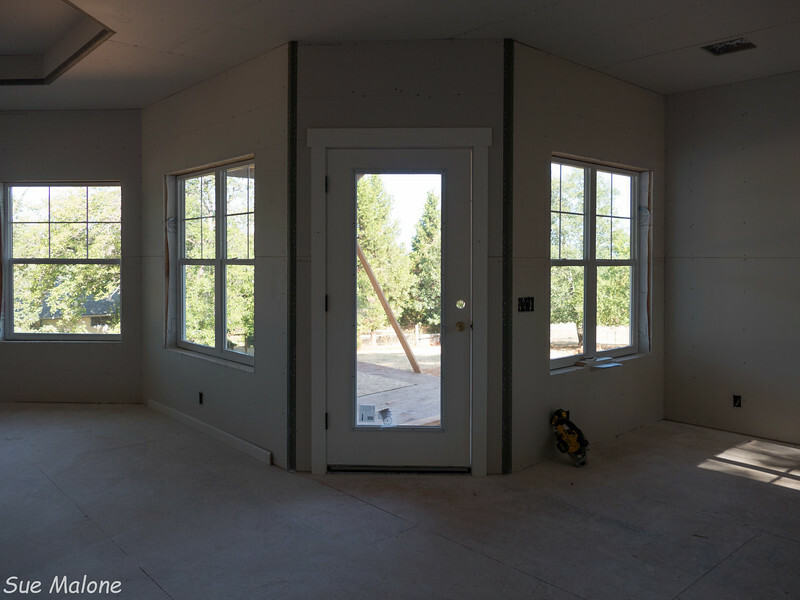 With just the framing up, it was darker than I had imagined it would be with all the windows, but once the drywall was on, it changed everything. Light! It is so wonderfully light! 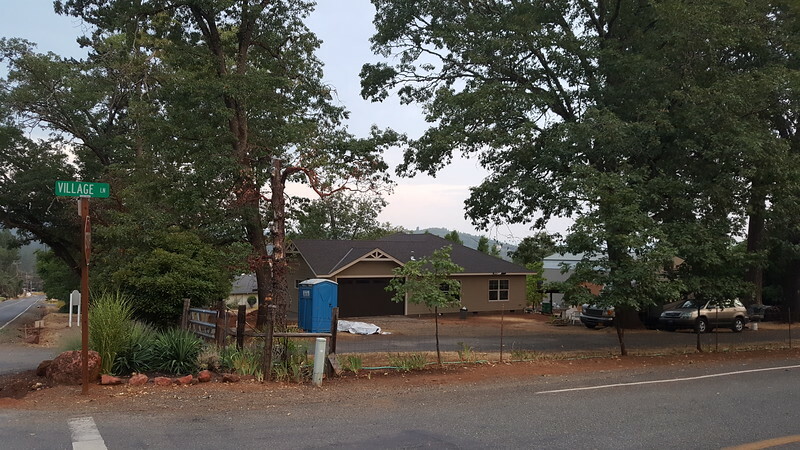 We spent a couple of days with Jimmy and Nicky, (I will be writing this post shortly) and returned to Grants Pass on Thursday to find that the A-Team really was there, and the siding was going on. Exciting to watch that happen. 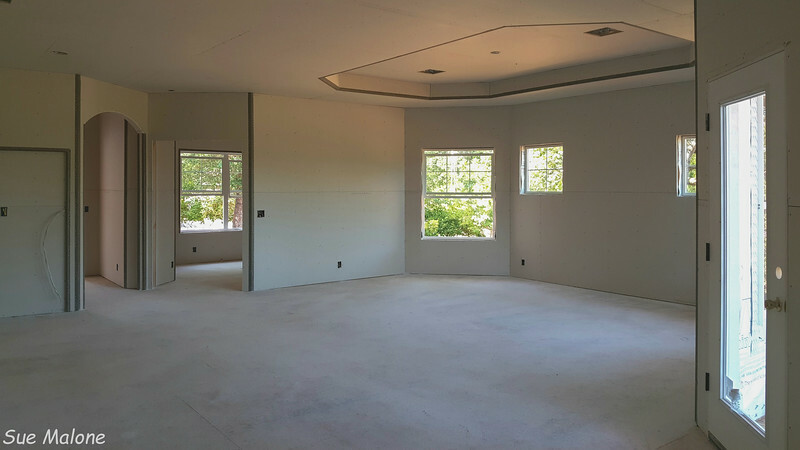 While they were working, the drywall contractor was completing the taping of the interior drywall. I didn’t manage to get a photo of that guy walking around on his bucket. 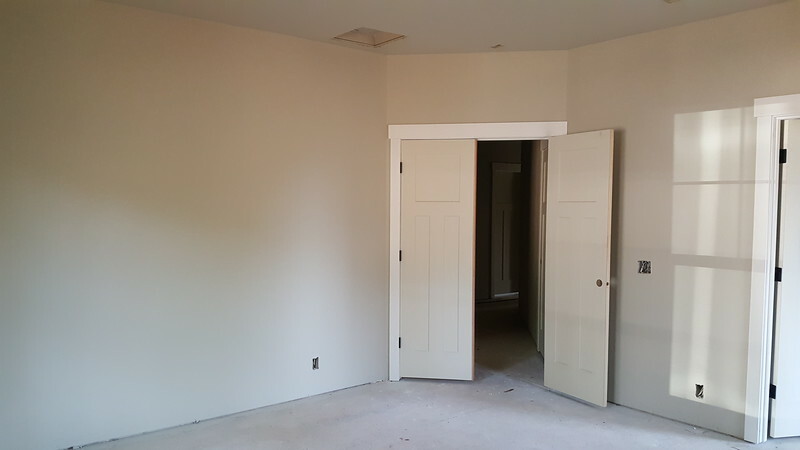 I remember drywall tapers using stilts, but this guy just jumped up on his bucket and managed to rock and roll it around to do the 9 foot ceilings and high places. That was rather amazing to watch. 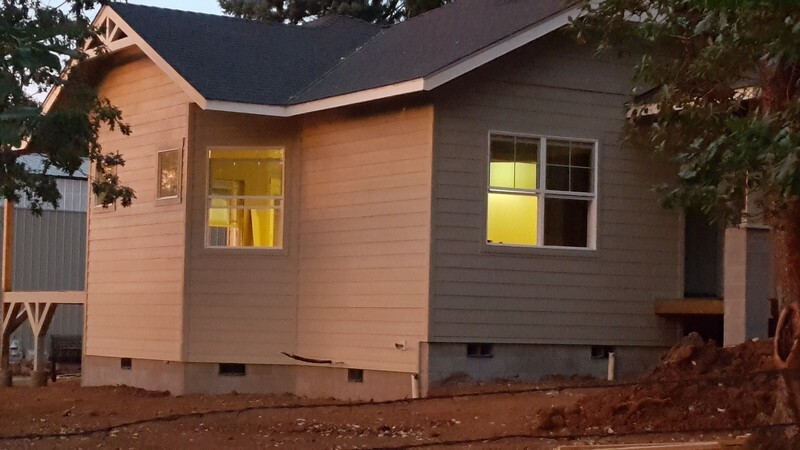 By the end of the week, we were beginning to get a better picture of how the house will look when it is finished, with the siding and framing in place. Gary also brought some samples of baseboard styles and we weren’t thrilled with the standard OG 3.5 inch stuff that is in modern houses. 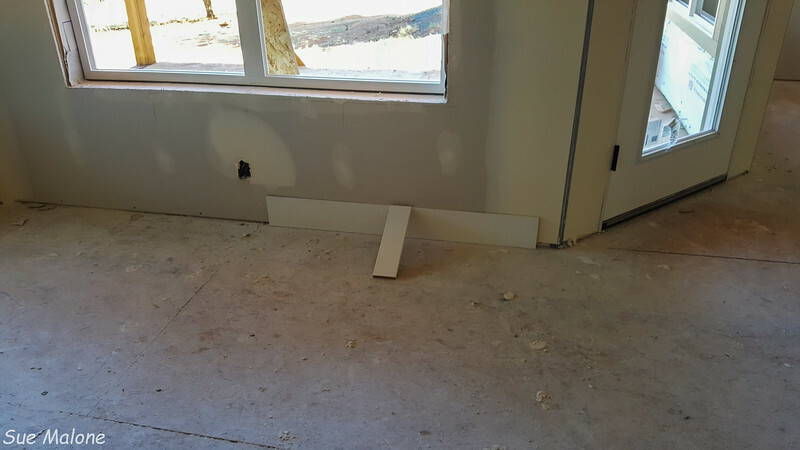 We instead decided on a 5 inch flat topped baseboard that is more in keeping with the Craftsman feel of the house. Made me really happy, reminding me of the house on Painter Street that was built in 1942 and had that same kind of baseboard. We also made decisions on doors, deciding that a “minimal” upgrade to the Shaker doors that we originally wanted but weren’t included in the original bid was worth it. 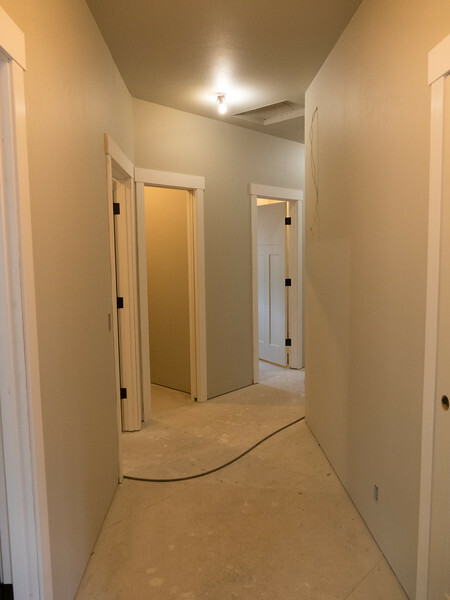 So far, our only actual change orders have been for the doors and for the upgraded baseboards. 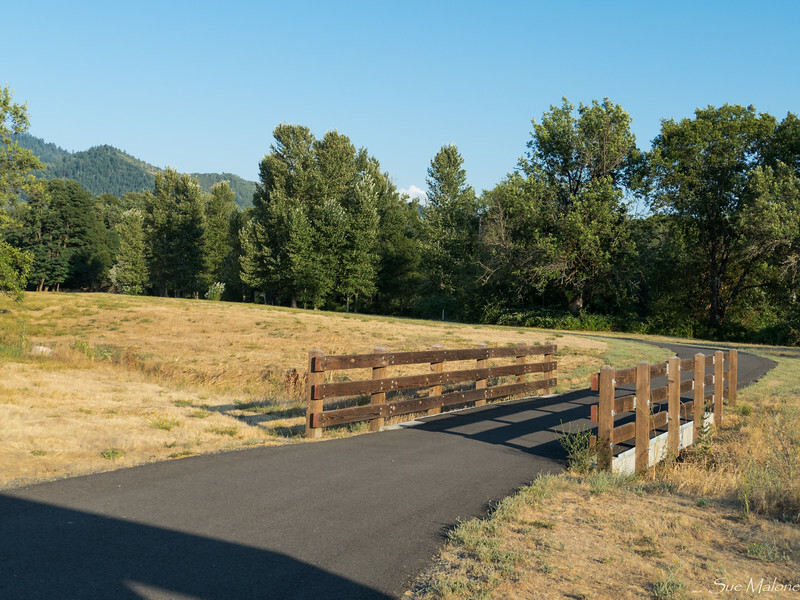 July 26 After a week at the Running Y, where we enjoyed a visit from Jeanne (I will write this post very soon), we returned to Grants Pass again to find exciting new changes. 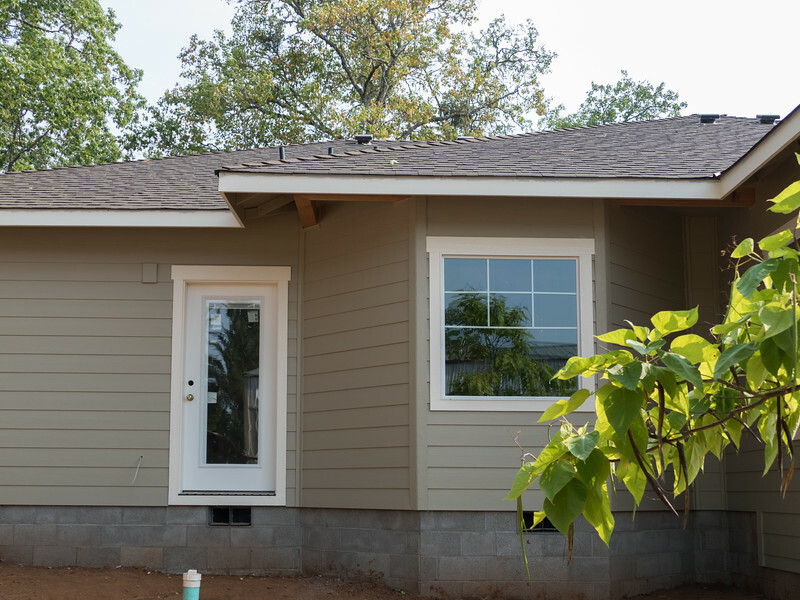 The siding and trim were almost completed and ready for paint. 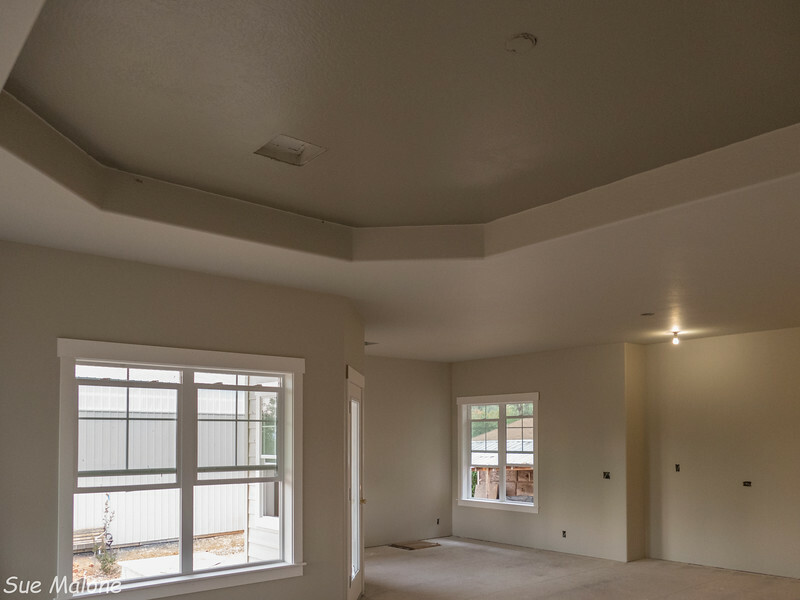 Gary did a fabulous job designing the gable treatments, and something we hadn’t even thought of were the custom attic vents. Later that day, driving around town checking out new houses, we saw several examples of store bought vents, squares, rectangles, circles, and octagons. 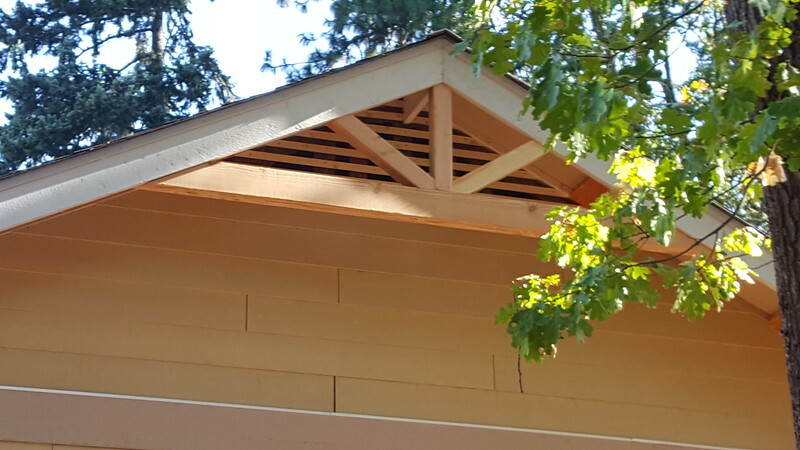 The custom vents under the gable treatments are a great touch, another reason we so appreciate our builders. Gary also had a mock-up ready for us for the porch columns, and brought the box of our chosen rock facing that will cover the pillars to see how it would look with the planned column treatments. 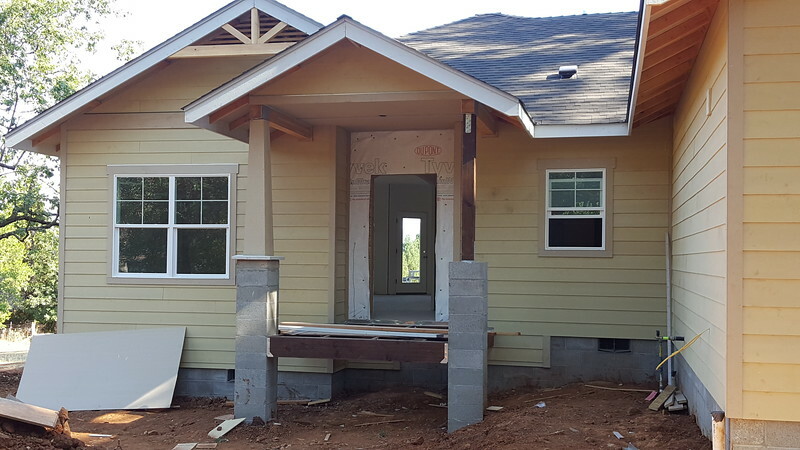 We talked about different ways to trim the front porch upper cross beams, which will be stained rather than painted. We drew out the proposed cement walkway that will meander from the garage and driveway around toward the front porch entrance, painting the dirt with blue paint and talking about how much Gary planned to raise the ground level with solid fill so that we will have only 3 steps and 4 risers at the main entry. Mo and I will use the garage entrance most, and there is no step there except for a small lip from garage to laundry room, perfect for us. No steps, and all one level! We had a great time with Maryruth and Gerald (another story to get posted soon) and returned once again to the Running Y on the last day of the month. 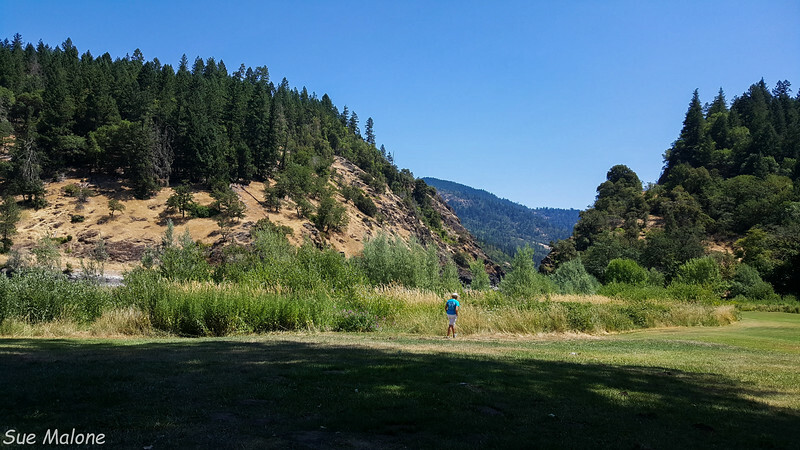 We were definitely ready for that few days of down time, especially since the temperatures in Grants Pass during that week reached 114 degrees. 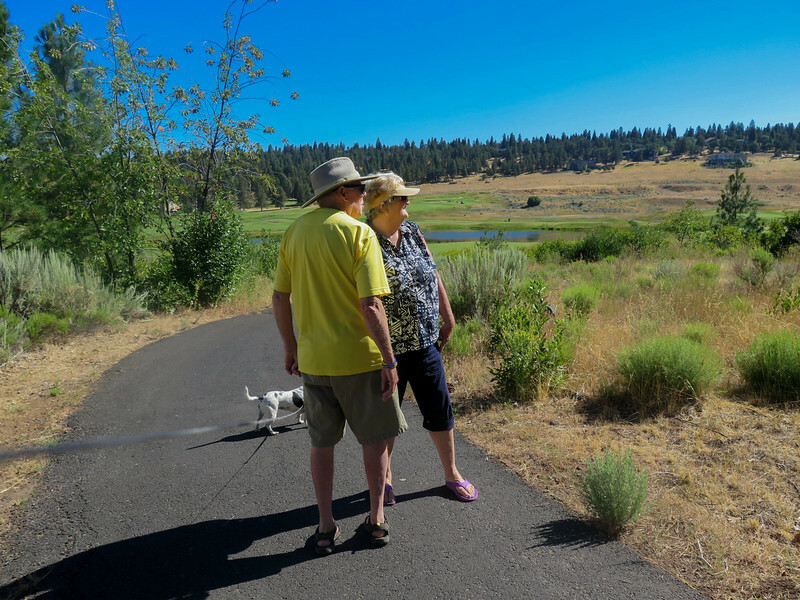 Klamath Falls was in the triple digits as well, highly unusual for the Klamath Basin, but we stayed cool and comfortable in the air conditioned villa, and I took daily morning walks on the pathway before it was too hot. I would check pavement in the evening, and if I couldn’t walk barefoot on it, I wouldn’t take Mattie, so mornings were the only time we could get out. 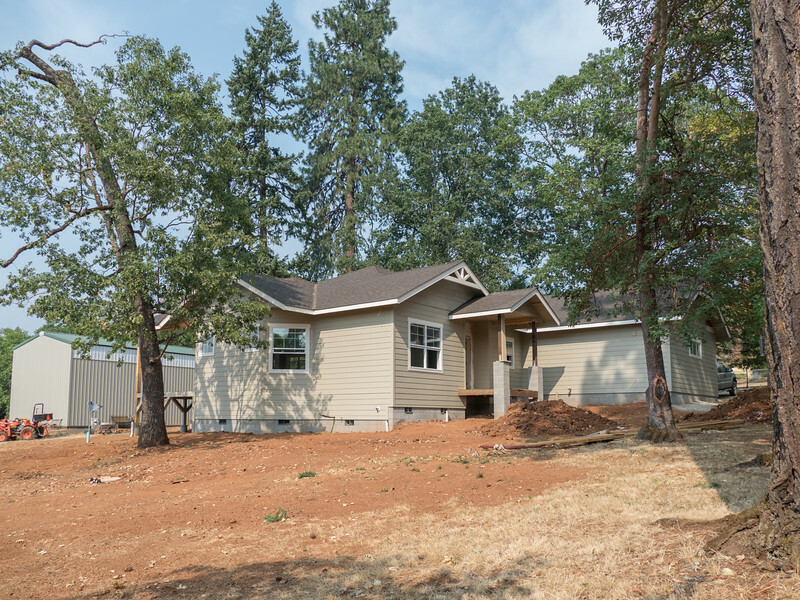 August 7 Every time we return to the house build, it gets more exciting. It was actually a little bit scary, because we knew that the interior and exterior painting was going on in earnest. We spent a long time deciding on colors, and knew we had to live with our decisions. No going back once all that paint is on!. I was really nervous driving up the road, praying that it was OK. Surprise. We loved it. Or maybe not such a surprise because we spent a lot of time trying to match the color of the RV shed and choosing the interior paint with much reading and sample approval. 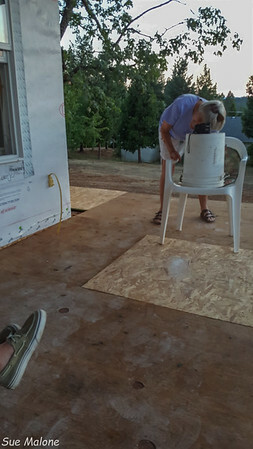 Funniest moment was standing in front of the house and seeing that the east wall of the house wasn’t anything at all like the south wall of the adjacent RV shed. (See the apparent difference in the above photo. )“Well shoot, it doesn’t match, but I guess that is OK”. But then the next morning, with the rising sun on both eastern walls of each building, it was a perfect match! Light and angle makes all the difference. We noticed the same effect from the west side during different times of day. 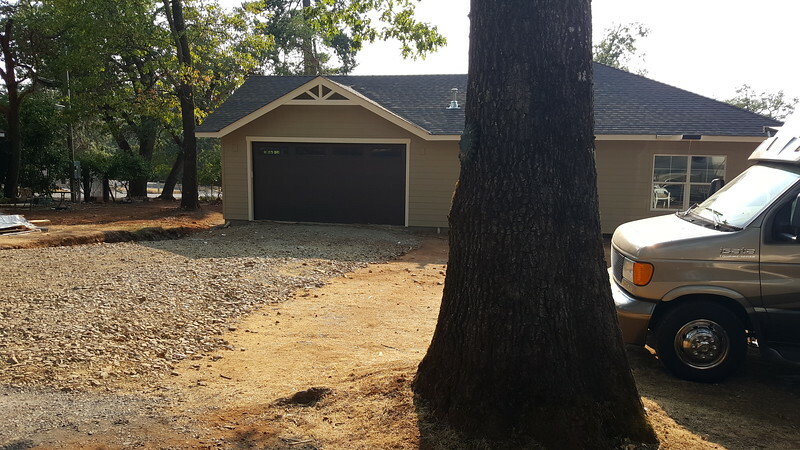 Deciding on a garage door was also a process. 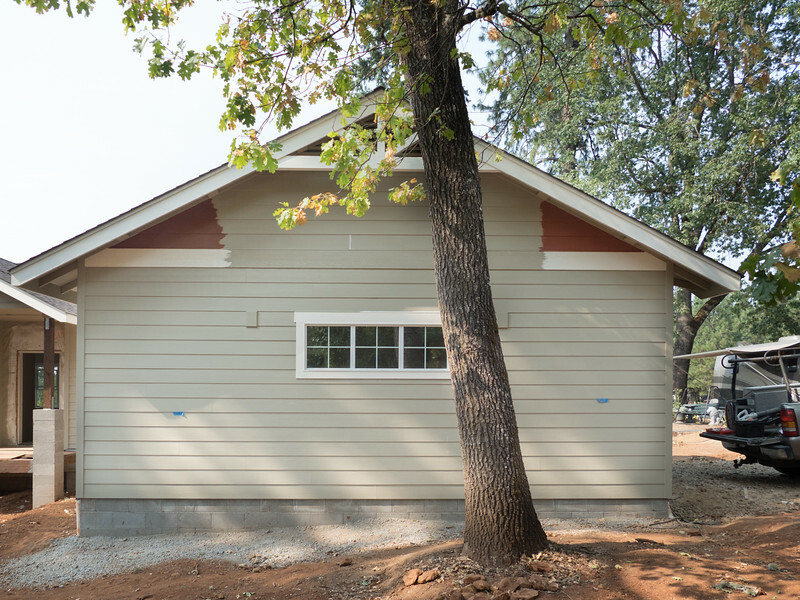 There are only 2 colors that are standard, white and brown, otherwise the door can be overpainted with the house body color. That isn’t really a good option because the exterior paint doesn’t wear nearly as well as the baked coating that comes standard on the door. 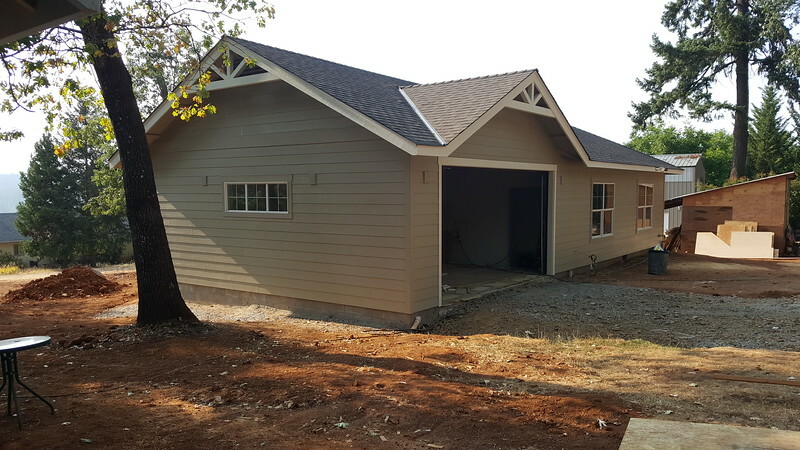 We were thrilled with the look of the door with the roof color. We also were amazed at the quietness of the door itself. You can barely hear it going up or down! I was a bit concerned about our choice of Revere Pewter, a Benjamin Moore color, for the interior. I searched and researched, and really wanted to try a warm gray. 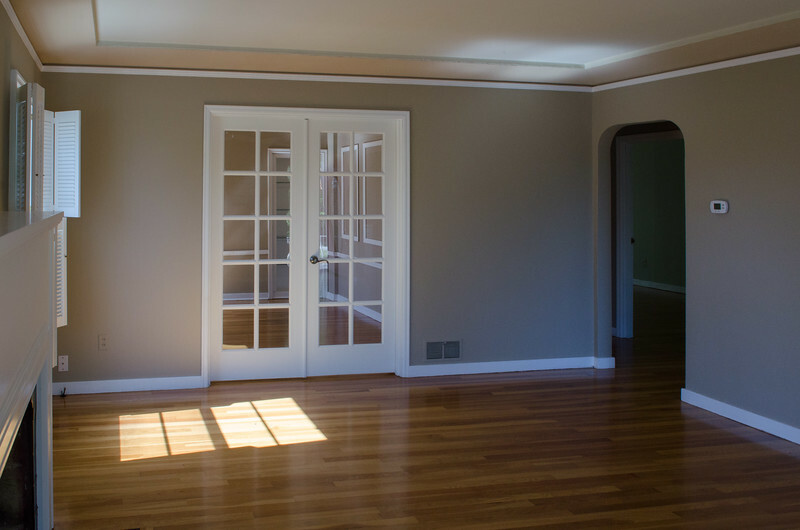 But after years of warm earth tones in our homes, moving to gray was a big shift. When I first walked in, I loved it, then I wasn’t sure, and then I loved it again. The color is like a chameleon, shifting and changing with the different kinds of light in the different rooms. The subs all love it too, even the ones who say they don’t like gray. Gary told of us a house they did where everything was gray, and it looked so cold and clinical. Gary loves our gray and so do we. 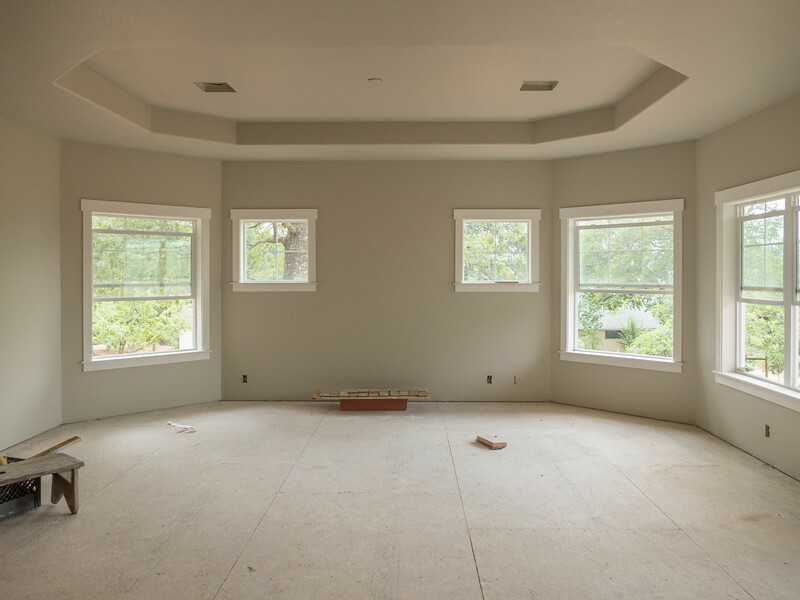 It is soft and warm and will look great when the wood floors are in. Another little glitch happened when the vinyl we had chosen for the bathrooms and laundry room was suddenly discontinued. The one on the left was discontinued. 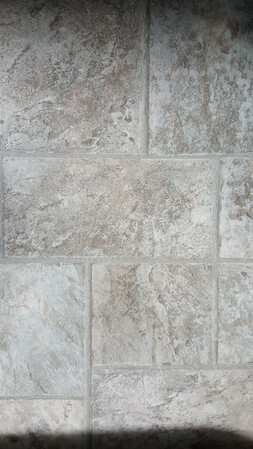 The new vinyl looks a little bit like our antique tiles on the right. We spent some time at Lipperts, the flooring provider, and found something even better. The first choice was an almost white that would have been similar to the marble surfaces that are in the bathrooms, Instead, we found a diagonally placed stone pattern that includes grays, beiges, the blue-gray-green that is in our carpet, and the brown of the wood floor. 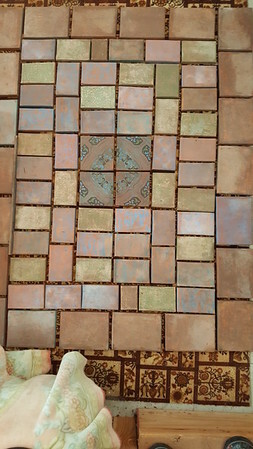 It looks much like the tiles that we are installing in the entry way, and even though it won’t be nearby, it will carry the theme throughout. It will also be great for that main laundry room entry which I expect to catch most of the outside dirt. 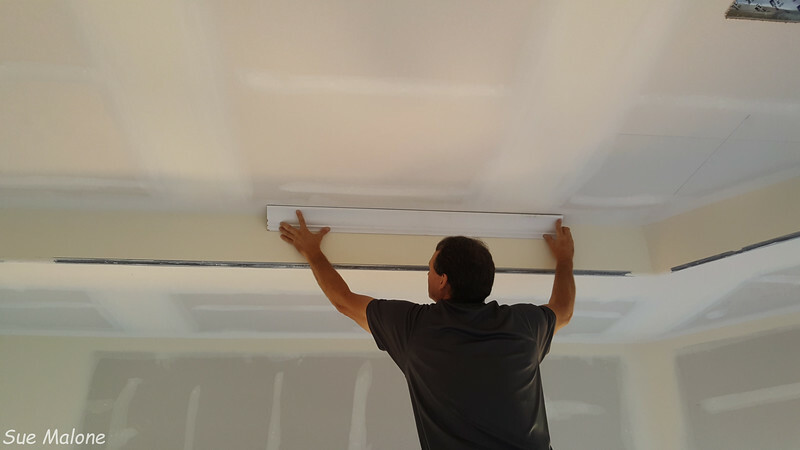 Because the painter bid for only one trim color and only one interior body color, Mo and I decided to paint the upper interior of the tray ceiling ourselves. We chose a shade of warm gray that is just a bit darker than the walls. The separation of the two colors with the white crown molding will emphasize the architecture of the tray well. 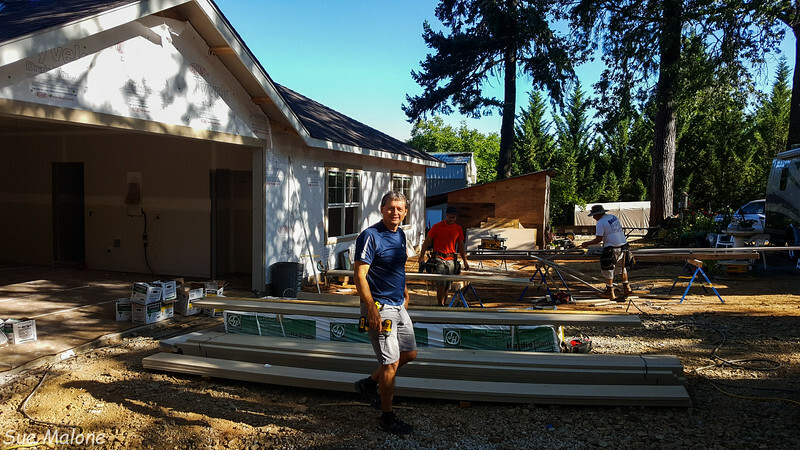 Gary spent a lot of time with us this week, helping with decisions, working out the details of our custom closet packages, and helping with the final decision of the exterior accent color and which gables would be painted the deep brick color that we finally chose. When we return, we will see how it all comes together. 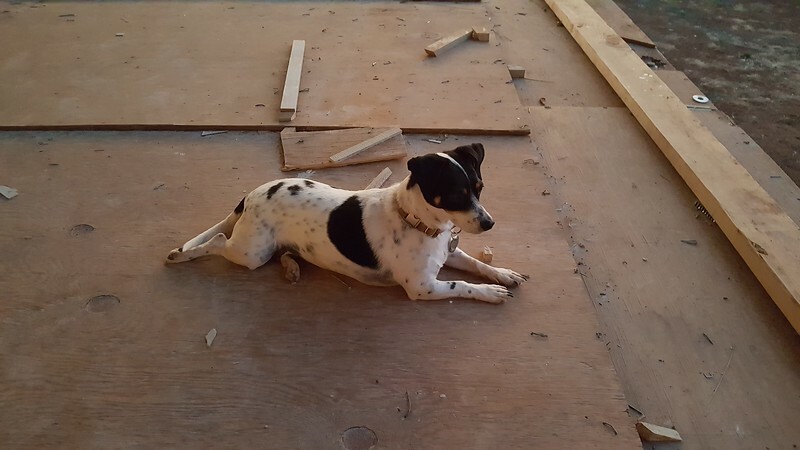 Gary says we are doing great, that we are making quick choices and the build is going well and is on schedule. Still, it is hard to not get impatient as we wait for each process to complete. Cupboards are in the works, but the templates for the granite can’t be made until the cupboards are actually installed. It is all so integrated, with each step forward required many steps completed prior to that next step. We are amazed and impressed at Gary’s ability to keep everything moving forward and on track. 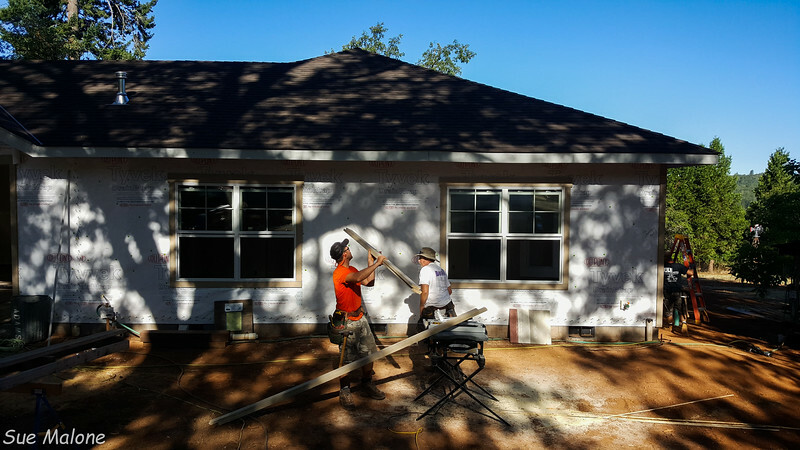 Lots of stories about private building contractors aren’t nearly so positive. We are on schedule for a November 1 estimated completion date. Let’s hope that everything keeps moving forward as well as it has so far.